In The Inner Circle, Tot invited fellow archivist Beecher White to join the Culper Ring--a secret group first assembled by George Washington during the Revolutionary War to protect his secrets and win the war--after Beecher stumbled upon a presidential secret. In The Fifth Assassin, the sequel, apparently (I haven’t read it yet) Tot was shot in the head and Beecher assumed his position as the head of what remained of the Culper Ring. 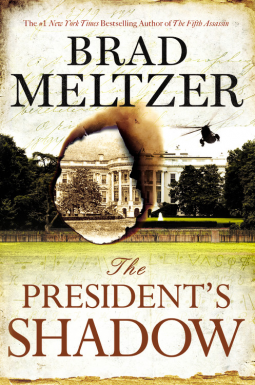 In The President’s Shadow, this third installment in the Culper Ring series, Beecher “sneaks” into the White House only to discover they were waiting for him all along. The First Lady Shona Wallace unburies, while gardening, a severed arm that had been buried in the Rose Garden by a White House intruder. The president’s inner circle suspects it was done with inside help. In its closed fist, the severed arm is holding a penny with an inscription that ties it to Beecher’s personal history, or rather, that of his father’s service in the armed forces. Beecher needs the president to know more about his father and how he died. The president needs to keep the investigation under wraps and off the press. Who better than Beecher and his Culper Ring to investigate? I think this country is in real trouble if the Secret Service needs help from an archivist to solve a case like this, still I willingly went along for the ride. Count on Brad Meltzer to concoct a story where fact and fiction intertwine seamlessly and U.S. history is just part of the mix with such outlandish result that could very well be real. With small bite chapters and easy to read prose, The President's Shadow will breeze before your eyes. Secret government agencies, ultra secret government projects in off the grid locations, conspiracy theories...What's not to like?! This is new to me. Sound like it might be an interesting read. It is an enthralling read but it hasn't been published yet. It'll be released on June 16. It is right up the alley with the mystery series you like.